Charles University Professor Martin Krbec heads the Orthopaedics and Traumatology Clinic at the Královské Vinohrady University Hospital. He told me more about the anniversary in a field where the replacement joint itself is expected to last some 25 years. “The beginning of modern endoprosthetics of the hip joint is dated to early 1960s and is connected with Sir John Charnley in England. 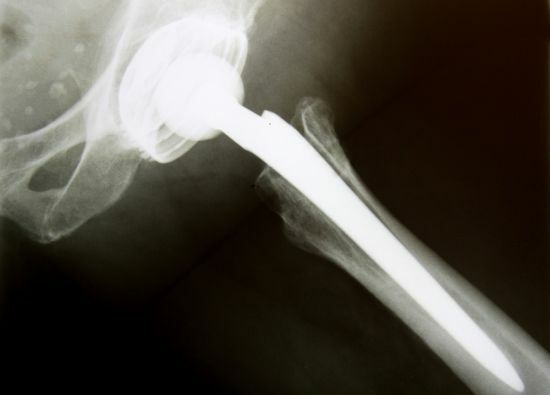 He was the first to develop a successful so-called total endoprosthesis of the hip joint, meaning the replacement of both components of the joint – the head of the femur and socket – acetabulum. “The sliding surfaces used in this joint were a combination of metal and polyethylene providing very low friction, what enabled good long-term function. In late Sixties the method was broadened in Western Europe and further development continued namely in Switzerland. The original Swiss endoprosthesis was developed by professor Maurice Muller, the so called “banana” stem and polyethylene socket. What was Professor Oldřich Čech’s contribution? “Professor Čech used the opportunity to be at the right place at the right time. In the years 1967 and ‘68 he was employed at Orthopedic Clinic in St. Gallen, under the leadership of Professor Maurice Muller, who was another great contributor to this technology. “After his return to Prague, he performed the first THA surgery at the First Orthopedic Clinic in Prague on 19 Feb 1969 using an original Swiss endoprosthesis which at that time was imported in limited numbers only. It was the very first implantation of such device within the entire Eastern Bloc. Later on, Professor Čech played an even more important role, taking centre stage in the development of the original Czech hip endoprosthesis. Production started in 1972 at the Poldi Kladno iron and steel works outside of Prague. Is it fair to say that the design of this articulate hip joint hasn't changed that much over the years but the material has? “Concerning the design of the prosthesis the main principle – the ball-shaped joint - remains the same. The design of the stem has changed several times during history in order to achieve better contact between the bone cavity and surface of the implant. The surface of the implant that time was relatively smooth and prosthesis was fixed to the bone by use of bone cement (polyacrylate). I have heard that specialists in this field such as yourself don't count time in years but decades. How many cases of hip replacement surgery are there in the Czech Republic annually? As far as operations go, have there been big changes or improvements in the procedure over 50 years? How difficult is it for the patient in terms of healing and full recovery? “After surgery, the patient is free of previous serious constant nagging pain. Of course, at the start there is some postoperative pain, but that can effectively be reduced. Rehabilitation helps to gain full range of motion of the joint. And this is the aim. Patients are usually very motivated to be back in normal life soon. “Sometimes you get a young patient, about 20, who needs hip replacement - usually as a consequence of developmental hip dysplasia. The symptoms are a minimal range of movement in the joints, almost non-ambulatory, but not too much pain. The decision to operate or not in this age and under the expectations of the patient on one side and the potential risks and limited survival of the prosthesis on the other side is not simple.